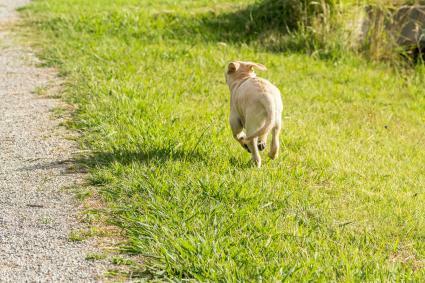 Dog owners can face a difficult choice when they want their pets to have room to run around and safely play without leaving their yard. Traditional fencing can often be quite expensive and possibly restricted, leaving you with the option of hidden electric fencing. The various electric fencing brands all work on the same general principal. A cable is run along your boundary line and buried. The cable is connected with radio signals to a control panel which is linked to a collar that your dog wears. The receiver on the collar picks up signals when it moves closer to the boundary cable. The collar will play a warning sound or vibrate and if the dog continues to move toward the cable and tries to cross, a shock will be generated to inhibit the dog from moving off the property. Most systems also include lawn flags along the boundary line to give the dog a visual marker. If the dog is properly trained to move away from the boundary when he hears the warning sound, feels the vibration, or sees the flags, the fences can be a valid way of containing dogs in your yard. Many homeowners are prohibited from building an actual fence due to local regulations or homeowners' association (HOA) rules. They are much cheaper than a traditional fence, especially if you have a yard that isn't relatively flat with easy terrain. Some dogs cannot be contained by normal fences because they are excellent escape artists. There's no cost to maintain the fence once it's installed, whereas a typical wooden fence requires regular upkeep. Despite the fact that an electric fence can work, there are downsides to using them. In fact, in 2018 the United Kingdom is considering a ban on electric boundary fence systems and their use in front yards or without supervision is not allowed in cities in the U.S. such as Overland Park, Kansas. Certified Dog Behavior Consultant Barbara Davis of BADDogs Inc. Family Dog Training & Behavior, Corona, CA said, "Although electric fences appear to be a cost-effective alternative to structural fences, they are a very flawed solution. 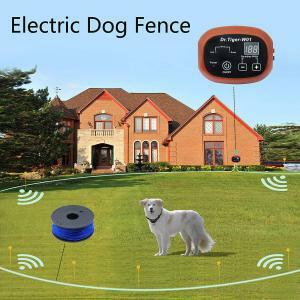 Electric fences are likely to fail when they're needed most, leave the dog inside vulnerable to people and other animals who enter onto the property and may contribute to the development of behavior problems." In order for the electric fence to work, the shock the dog feels must be significant enough to act as a deterrent. This level is individual to each dog and a shock may be set too low or too high, which leads to potential fallout. Dogs may associate the shock with the boundary, but there's also a probability the dog may associate something else with the shock. That association could be with people walking by, other dogs and animals, or anything else that might be in the area. Davis explained, "This can lead to fear which in turn can lead to aggression to people and animals." Other dogs may generalize the fear to the entire yard and refuse to go outside at all. An electric fence does need maintenance, such as checking the batteries and the fit of the collar. If you aren't paying attention, batteries can die out without being replaced or the dog could lose the collar while playing if it's too loose or damaged. Power outages and inclement weather can also cause the system to fail temporarily. Given the value of item the dog wants to go after, such as a squirrel, the dog may decide it's not enough of a deterrent to keep them from getting to the thing they want in the future. Some breeds with a high prey drive, such as Greyhounds and terriers, may not care enough about the shock to stop them from chasing small animals. "On the other hand, if something sufficiently scary happens, such as fireworks in the neighborhood, that might compel a dog to take the shock and run out of the yard because he is simply too terrified to stop," warned Davis. If the frightened dog manages to come back to your yard on his own, he will have to take a shock in order to come back to the house which may deter him from entering the yard at all. It's not just a matter of installing the fence but owners must go through a training period with the installation company and continue working on training until the dog reliably understands what the collar warning means. If the company staff doesn't sufficiently coach you on how to train properly, or if you ignore the important step of reinforcing and practicing on your own, the dog may either ignore the fence or develop behavior problems if they become shocked without understanding why. Even if an electric fence works well and keeps your dog in the yard and he is happy, this doesn't mean it keeps anything out. Other animals can pass through the boundary such as an off-leash dog. Another concern Davis noted is that, "If your dog has become aggressive with strangers due to the fence, having a stranger, albeit a friendly one, walk right up to him could very likely result in a bite". 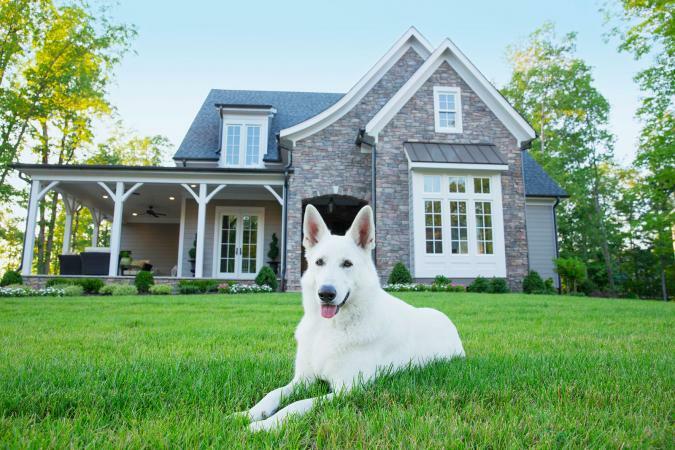 Children living next door may wander over to say hi to the dog, and the postman or gas meter reader may walk onto the property unaware that a dog is loose in the yard. There are definitely pros and cons to using an electric fence and the decision should be left up to each individual dog owner. Make sure if you decide to use one that you are aware of all the risks and are willing to train and monitor your dog properly to avoid potential behavior problems and safety concerns.